Where does a Captive Northern Water Snake Hide When it Escapes its Enclosure? Whenever you consider obtaining a snake as a pet or maintaining a wild one in captivity for even a short period of time be sure to secure that the enclosure they are in is secure. Snakes are escape artist and if your enclosure has the slightest flaw they (snakes) will exploit it and escape. Such is the case of the 4 ft northern water snake that escaped its enclosure prior to a presentation. The animal of course is a nonvenomous species and the public was never in danger but the potential for a unique surprise to anyone not suspecting an encounter with such things could have been very interesting experience. 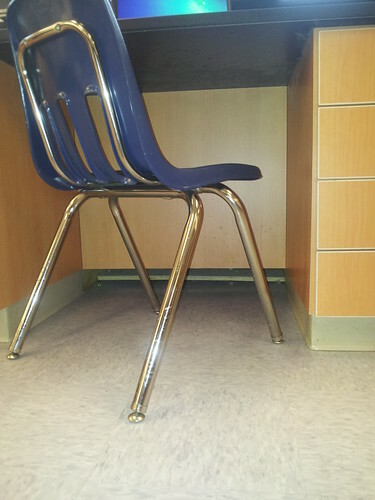 The photo above was taken between a wall and a row of computer cabinets where the snake was believed to have been hiding. 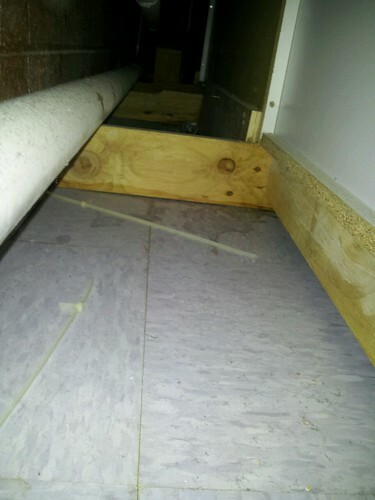 Access to the area was extremely limited given the width between wall and cabinet was slightly over one foot wide. The pic was taken using a cell phone and was done so by blindly sticking my hand behind the wall and taking a “blind” photo. This gave me a view of what the area looked like behind the cabinets and hopefully would be able to see if the snake was actually there or not. 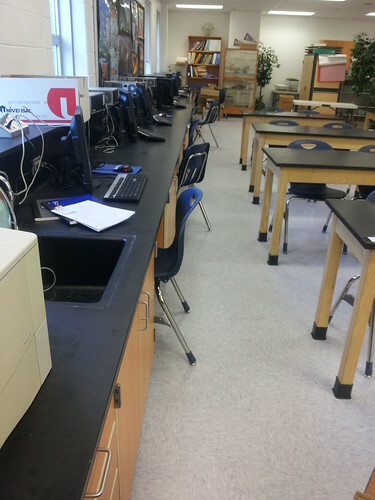 I wish I could take the credit for this idea but the reality is that the idea was from a student Harrison Gust. Brilliant idea on Harrison’s part. 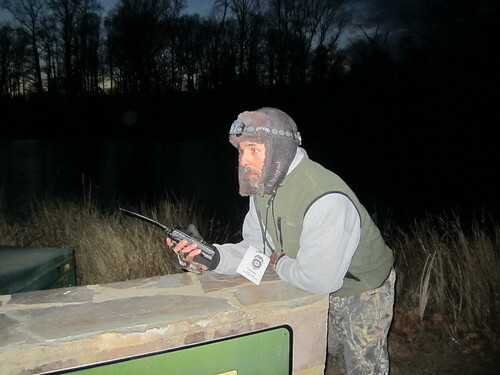 A very frighten look and yet embarrassing pose of me while on Ghost patrol at Walney Pond Last Night. Note the orb in direct line with my headlamp LOL. Ah the jobs only a wild life biologist can give to her volunteers. Actually had a good time great lady to work for. Tonights mission objective: To deter the night pirates from poaching turtles out of Wlaney Pond. Has anybody mentioned to our boss that the pond was frozen? Final report-no turtle poachers apprehended and the Wildlife Biologist successfully conducted her operations without a hitch. 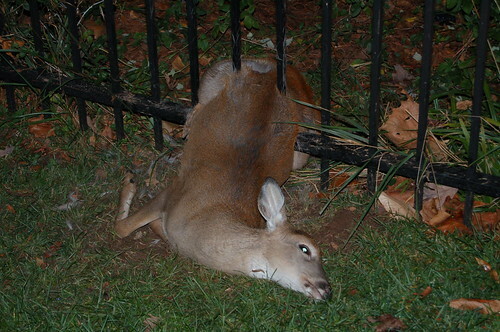 This unforutnate deer was discovered caught between the fence post nearBalmoral (Compton Road) in Novemeber 2009. 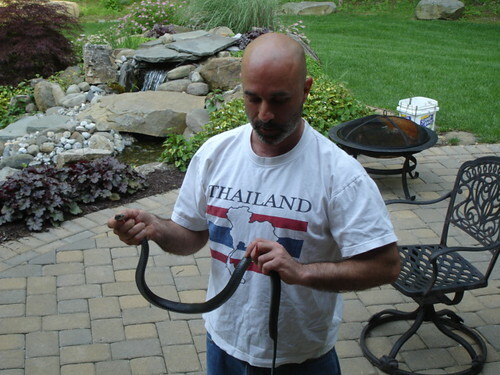 Was called by a resident living near Pleasant Valley road in Centreville to remove a black racer from their patio. Apparently this female racer decided she was going drop her eggs inbetween a crevice along the steps connecting the outside patio to the house. 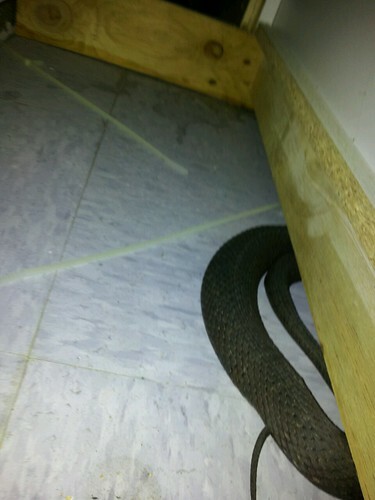 One of the resident homeowners wanted the snake gone dead or alive. Fortunately the husband called and asked me to come remove it (alive). The bitter sweet end to this story is that I was able to dislodge the snake uharmed and relocate her safely but in the stress of it all she dumped her eggs in the sack I used in transporting her to nearby habitat.